Venezuela's Embattled President Loses Support, But Clings To Power : Parallels Nicolas Maduro presides over an unraveling economy marked by empty shop shelves, food riots, malnutrition and unrest. He's losing backers, but still has the military on his side. 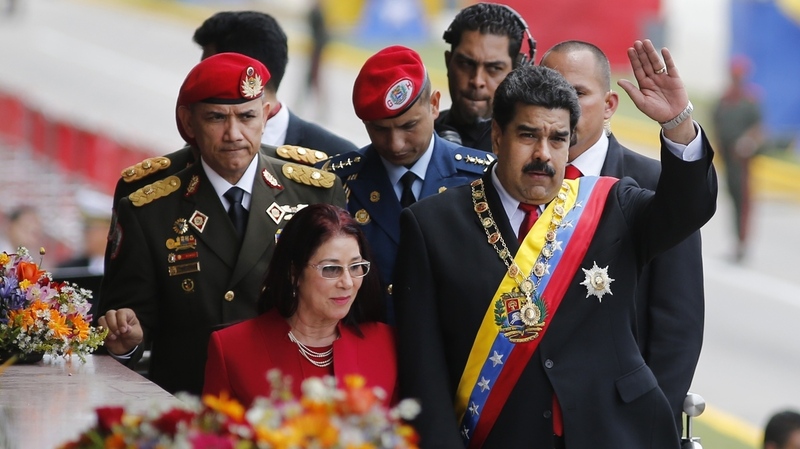 Venezuela's President Nicolas Maduro waves to supporters as he walks with his wife Cilia Flores in the capital Caracas on July 5, Venezuela's Independence Day. As the country's crisis has deepened, Maduro has lost support, but the military remains on his side. As Venezuela unravels — with shortages of food and medicine, as well as runaway inflation — President Nicolas Maduro is increasingly unpopular. But he's still holding onto power. "The truth in Venezuela is there is real hunger. We are hungry," says a man who has invited me into his house in the northwestern city of Maracaibo, but doesn't want his name used for fear of reprisals by the government. The wiry man paces angrily as he speaks. It wasn't always this way, he says, showing how loose his pants are now. "We call it Maduro's diet," he says. "I'm thin. And I work for a minimum wage. And I have two kids. And I don't eat myself in order to make sure they can eat." The worsening food shortages in Venezuela are hitting people like this man, the working poor, the hardest. He tells me he used to be a supporter of Hugo Chavez, the president who brought his brand of socialism to Venezuela 16 years ago. But Chavez died in 2013, and my host has nothing good to say about his successor, Maduro. "We want a change in Venezuela. And we want it now. We cannot live with this system of government anymore," he says. Polls show many Venezuelans now agree with him. Maduro and his ruling Socialist Party are losing their base of support. Venezuela's government says it is the victim of an economic war that has crippled its economy. It alleges the opposition is in the pay of the U.S. government, which is intent on overthrowing it. The opposition and the U.S. both deny this charge. The opposition took over the legislature, the National Assembly, after a sweeping election victory last December. And the opposition is now trying to push through a recall referendum, which, if they get enough votes, could see Maduro's term cut short. Maduro's critics say his government is using all the tools at its disposal to make sure he stays in power. It controls the judiciary, the military, the executive and most of the media in the country. And it has other tactics. Carolina Ramirez, who worked at Venezuela's tax authority for more than 12 years, says she was recently fired – without explanation – along with 40 other co-workers. She says they all had one thing in common. "We had all registered and signed in favor of the recall vote," she said, referring to the effort to remove Maduro from office. She says she believes the government is punishing her and sending a message to other people with state jobs. "The government is feeling threatened," she says. "People want change and the only leverage they have is against public servants. It might make people think twice because they can lose their jobs." If a recall vote is approved, the opposition will need a lot more people to come out and vote against the Maduro government. On a recent morning, a few dozen opposition demonstrators rallied outside of the courthouse to protest the imprisonment of opposition leader Leopoldo Lopez. "We are seeing that political repression is intensifying," says David Smolansky, an opposition mayor from a municipality in Caracas, who was taking part. He points to a spate of recent arrests of opposition activists. Just last week, six young protesters were detained and last month two other activists were put in prison and charged with terrorism. "When authoritarian regimes are weak and are in their death throes is when they start using repression and violence to stay in power," says Smolansky. Despite such forecasts, many analysts say it's not clear what will happen next. The government has taken control of food distribution and the military is for now, on their side. "It's completely within [the government's] hands to keep power and I think stymie this recall referendum," says David Smilde, with the Washington Office on Latin America. "And in this sense, it's really a crisis. There is a huge gap between what the people want and what the reality is of power in Venezuela right now." For now, food riots have been quelled by the National Guard. But some worry they could return and become widespread. "We are starting to see looting that takes on an epidemic quality," Smilde says of the recent unrest. "You'll get five, 10, 20 stores that are looted. I think that kind of social upheaval is what could be a big problem." And that could persuade the military or Maduro's party supporters that it's time for him to go. Smilde says the next few months will be key.